The power of Microsoft combined with WBA's reach. 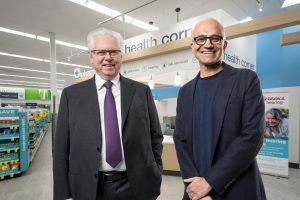 DEERFIELD, Ill. — Walgreens Boots Alliance Inc. (WBA) and Microsoft Corp. have teamed up to develop new health care delivery models, technology and retail innovations to advance and improve the future of health care. The companies will combine the power of Microsoft Azure, Microsoft’s cloud and AI platform, health care investments, and new retail solutions with WBA’s customer reach, convenient locations, outpatient health care services and industry expertise to make health care delivery more personal, affordable and accessible for people around the world.